6.00-8.30pm The Dissection Club: Symposium Opening Night at the PAH HOMESTEAD, 72 Hillsborough Rd. Collusion between artist, chef and the dissection club. 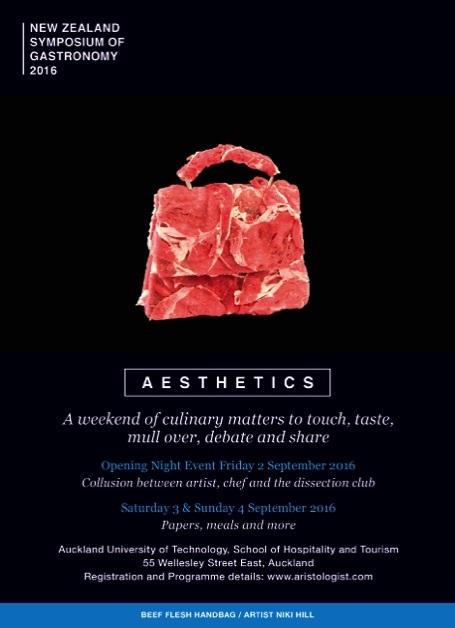 Beef, flesh handbag artist Niki Hill, Judge Bao & the Dissectionist. Drinks with Grazing Supper by Judge Bao. 9.15 Christine Hall: AUT Master of Gastronomy. 9.30 Robert Richardson: Bring a plate? Social Food Gatherings in New Zealand. 10.00 Tracy Berno: The 100% Pure" advantage: Putting the Culture into New Zealand agriculture. 11.00 Angela Clifford: ConversatioNZ: Making New Zealand Food Famous. John Logan Campbell's daughter's letters. 12.00 Lorraine Wilson: Winifred's War - Winifred Campbell part 2. 1.45 Nat Cheshire & Daijing Tai: Common Ground, Uncommon Space. 2.30 Giapo : Giapo Haute Ice Cream & Demonstration. 3.30 Shona Dey: Food, Aesthetics and Photography. at the Christchurch Centre for Design. 4.30 Aaron McLean: Stonesoup: a conversation. 5.00 Giapo: Queen St, Civic Building. 9.30 Viv Teo: Breakbread & Short film. 10.00 Niki Hill: Aesthetics in Contemporary Art and the raw food product of artist Niki Hill. symbolic meanings in Iranian food culture. 11.30 Suzanne Bliss: Tart Lessons. 12.00 Alison McKee: The Art of Carving: A merry thought and a pack of playing cards. 12.30: Picnic Lunch at Albert Park. Library Visit: Sir George Grey Special Collections Exhibition: House & Home - domestic Life in New Zealand. Level 2, Auckland Central City Library, 44-46 Lorne Street. 2.00 Alexa Johnston: The Edmonds Cookbook Project. 2.30 Andre Taber: Baking Powder Label designs as worthy artifacts. 3.45 Jennifer Yee Collinson: Porridge, Congee & Weeds. 4.15 Duncan Galletly: The Illustration of Cookery Books. 4.45 Christine Hall: Dining in the Dark.